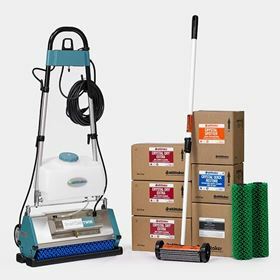 The Smart Care® TWIN Professional System includes everything needed to establish a Daily and Interim Carpet Maintenance Program, with the added convenience and improved productivity of an integrated electric chemistry applicator. 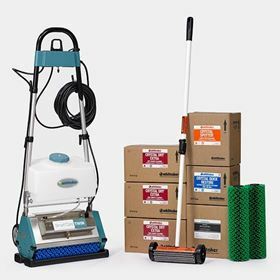 The system includes a dual brush TWIN machine, two-gallon electric applicator, CARPET ROAMER® Spotting Tool, an extra set of brushes, five cases of CRYSTAL DRY® Extra and one case of CRYSTAL SPOTTER®. It is available in 15 inch and 20 inch cleaning widths. The Smart Care 15-Inch Interim Pro System contains all of the necessary components used to achieve the Carpet & Rug Institute Seal of Approval for Interim Cleaning of both cut pile and loop pile carpet. 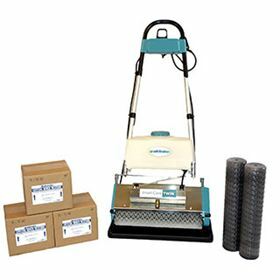 The Smart Care 20-Inch Interim Pro System contains all of the necessary components used to acheive the Carpet & Rug Institute Seal of Approval for Interim Cleaning of both cut pile and loop pile carpet.